Rolls are the main and very costly consumables in a rolling mill. They are used to roll steel in the rolling mill and their performance depend on many factors which include the materials used and the loads to which they are subjected to during service. The roll design is influenced by the limitations applied by the rolling load, the roll strength and the torque available for rolling. In case of flat rolling it is also influenced by the allowance made for roll bending and by cambering of the rolls. The roll design is to take-care the load and torque required for any pass. In addition it must ensure that the physical dimensions and material of the roll are capable of withstanding the heaviest loads arising during the rolling sequence. Another important factor where roll life is concerned is the wear properties of the roll material. In the rolling of steels, the material of the rolls is to be capable of withstanding loads which plastically deforms the rolling stock without itself being plastically deformed. In the rolling of hot steel this is not a difficult problem and iron or steel rolls are suitable if they are operated at a temperature considerably lower than that of the rolling stock. Whether iron or steel rolls are used in any particular case depends on the specific duty they have to perform and whether toughness, resistance to thermal cracking or shock loading or hard wearing properties is most important. 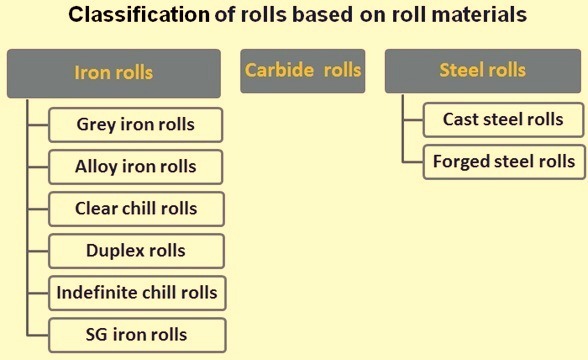 Rolls can be classified according to the roll materials (Fig 1) and the method of manufacture, the first main subdivision being (i) iron rolls, and (ii) steel rolls. This division depends on the carbon content of the material. In the case of rolls the demarcation line is usually taken at about 2.4 % C. Normally rolls are referred as being steel base below this figure, and iron base above this figure. There is a marked structural distinction between these two types as there is no free graphitic carbon in steel base rolls. Steel rolls may be either cast or forged so giving a further subdivision. One other division which cuts across the above classification is that of double poured duplex rolls which may be cast with a hard metal outer surface and a tougher and stronger metal forming the centre of the roll. Iron rolls are of the following types. Grey iron rolls – These are cast by sand casing and consist of grey cast iron (contains flakes of free graphite). The structure of the roll is uniform throughout and is very resistant to fire cracking. It is to some extent self-lubricating due to the free graphite which is an advantage where thrust collars arc used to resist end thrust during rolling. A typical analysis of the roll material is carbon (C) – 2.5 % to 3 %, silicon (Si) – 0.5 % to 1 %, manganese(Mn) – 0.4 % to 0.8 %, phosphorus (P) – 0.5 % max, and sulphur (S) 0 0.1 % max. The P is allowed up to 0.5 % to increase the fluidity of the metal during pouring but it is advantageous to reduce this if higher casting temperatures are possible as P is deleterious to the properties of cast iron. S is kept to a minimum and Si is chosen to regulate the free graphite content, since the presence of Si promotes graphitization. Mn is used to neutralize the S and to deoxidize the metal. Too high a Mn content resists graphitization. Alloy iron rolls – To improve the quality of the grey cast iron various alloying elements may be added to give the roll an increased hardness. These alloy iron rolls have only small quantities of nickel (Ni), chromium (Cr) and molybdenum (Mo) and they give slightly better wear and strength than the straight grey iron. The alloy iron roll with higher quantities of alloy additions is much harder and wears better though naturally it is more costly and must yield higher rolled tonnage. The presence of Ni promotes the formation of graphite but as it is in a very finely distributed form it leads to greater toughness and resistance to fire cracking. Cr increases the tendency to form combined carbon and restricts graphite formation so giving a much harder but more brittle iron. Mo and tungsten (W) promote the formation of combined carbon and in addition they add to high temperature strength. With a Cr alloy iron there is a tendency for collar breakage in section rolls due to the brittleness and in addition a good supply of water is necessary for cooling the rolls to avoid fire cracking. A typical analysis of the roll is C- 3 %, Si- 1%, Ni – 1 % (or Mo -0.5 %) and Cr – 1 %. A common brand of alloy iron roll is ‘Adamite’ iron. The hardness of rolls is a measure of the resistance to wear and it is usually expressed in degrees of Shore scleroscope hardness. The relatively soft grey iron rolls have hardness of 30-40 deg Shore, but these can be increased to the range 38-50 deg in the alloy iron rolls. This latter is a grey iron but the graphite is finely divided and the matrix is harder. Softer rolls are favoured for the roughing and intermediate stages of rolling and the harder alloy grain ones for finishing. Clear chill or definite chill rolls – A clear chill roll has a surface layer of white iron produced by inducing rapid cooling at the surface (by means of a chill in the mould) which restricts the formation of free graphite. The core is of grey iron due to the slower rate of cooling and the intermediate zone is a mixture of white and grey iron. The necks and wobblers or spade ends are not to be chilled and hence retain greater toughness. The chilled layer is hard and wear resistant but it is brittle. It is generally about 25 mm thick on plain rolls but may be increased where shallow grooves are required. The analysis is similar to grey iron rolls though the C content is higher. Lower C gives a lower hardness but it strengthens the roll and reduces the incidence of surface cracking and spalling hence it is used in cases of high stress such as in plate rolling. The surface hardness may be between 55 and 65 deg Shore but the rolls have good resistance to temperature change and fire cracking. A part chill roll is produced by chilling chosen parts of the barrel (e.g. finishing passes) and leaving the rest as grey iron. Alloying elements may be added to chill rolls to give hardness values of 65 to 90 deg Shore and may contain about 4.5 % of Ni with Cr balance the tendency to form free graphite. The Ni bearing chill rolls are claimed to have a work hardening tendency and are more suitable for cold rolling due to their susceptibility to fire cracking. Composite or duplex roll – A method of combining a very hard surface with a tough core is to cast the roll by double pouring. The first pour gives a shell of highly alloyed white iron which cools rapidly on the surface in a chill mould after which the second pour (often of grey iron) displaces the molten centre of alloy iron and replaces it with a tough core. The shell hardness is 75 – 95 deg Shore. Indefinite chill – With this type of roll there is a very thin clearly defined white graphite-free chill and no intermediate mix zone. The surface layers contain very small particles of graphite and the structure changes smoothly into the grey core. The hardness decreases slowly at first from the surface at a rate of about 1 deg Shore per 10 mm of depth and then more quickly towards the soft centre. Hence there is a good usable depth. The surface is more resistant to fire cracking and spalling than the definite chill roll and the rolls grip the rolling stock better. An alloy indefinite chill roll with a surface hardness of 55 to 75 deg Shore may contain Ni, Cr, and Mo. These rolls may be heat treated to toughen them against shock loadings. An example of this type is the Adamite indefinite chill. These rolls may be heat treated and are resistant to spalling and fire cracking. Spheroidal graphite iron rolls – Spheroidal graphite (SG) iron rolls are finding use in some mills. It is having graphite in the nodular form when cast by the use of a special casting procedure involving the addition of magnesium (Mg). The spheroidal graphite iron has much greater strength and toughness, the former being about twice that of a high duty flake graphite iron and the latter is increased about twelve times. Most of the rolls have a pearlitic structure but the acicular structure is also available giving better wear resistance. A good finish may be obtained on the rolls though care in machining is necessary as noxious fumes are given off. The wear properties of SG iron rolls are that they wear evenly and at a similar rate to flake graphite iron. They are suitable for use where a normal iron roll is not strong enough and where steel rolls give poor life due to excessive wear but, as they are more expensive than both iron and steel rolls, care in the choice of application is necessary. Hardness can be obtained up to 80 deg Shore or more. Steel rolls may be cast or forged. They are much stronger and tougher than iron rolls and are used therefore where an iron roll is considered not strong enough. They permit heavier draughts to be used especially where deep grooves are required. Breakages due to shock loading are much less likely to occur and the properties can be varied considerably by suitable heat treatment. However, C steel rolls wear more quickly than iron rolls due to their low hardness. Cast steel rolls – These may vary considerably according to analysis. The straight C roll has from 0.40 % to 0.90 % C and the hardness is from 28 to 36 deg Shore. Heavy mills (blooming, slabbing and heavy roughing) use the lower grades (up to 0.60 % C) while billet roughing stands use the higher grades. The addition of about 0.5 % Mo to this type of roll together with small amounts of Ni and Cr (or higher Mn) gives increased strength and reduces the severity of any fire cracks which may occur. The hardness is 30 – 42 deg Shore. More highly alloyed rolls usually lie within the ranges of analysis having C – 0.80 % to 1.0 %, Mn – 0.60 % to 0.90 %, Ni – 1.0 % to 2.5 %, Cr – 0.50 % to 1.10 % and Mo – 0.20 % to 0.40 %. A C- Cr roll (C -1 %, Cr – 1.5 % to 1.75%) is also made. These rolls are usually heat treated, the hardness range is 35 -55 deg Shore and they are commonly used as back-up rolls in 4-high rolling mills. An alloy steel containing tungsten (W) and with a hardness of 40 – 50 deg Shore is very resistant to fire cracking and is sometimes used for roughing rolls in hot strip mills. Cast alloy steel base rolls are made also with the analysis ranging C – 0.9 % to 2.5 %, Si – 0.5 % to 1.0 %, Mn – 0.4 % to 0.6 %, Ni – 0.25 % to 1.0 %, and Cr – 0.5 % to 1.5 %. The C content is in a higher range than in the cast steel roll. The entire C is in combined form. The hardness range is 30 – 55 deg Shore, according to C content, and the rolls wear well and are strong. The life is in line with the cost. Good water cooling is required. Forged steel rolls – These rolls are forged from a cast steel ingot and the necessary mechanical working results in an improved tougher structure. In the C steel form (0.35 % to 0.75 % C) they are used for blooming, slabbing and heavy roughing mills in the lower end of the C range and for smaller intermediate mills in the higher end of the range. This is somewhat arbitrary and depends on the particular mill conditions. They are normalized before use and the hardness range is 24 – 30 deg Shore. In the alloy steel form they may be heat treated to give a wide range of hardness. In the range 50 – 55 deg Shore range, they are used for large back-up rolls, around 80 deg Shore range for small back-up rolls in cold rolling, and 90 – 100 deg Shore range (fully hardened) for work rolls in cold rolling. A typical analysis is 1 % C, 1.5 % to 1.75 % Cr and 0.5 % Ni. Forged steel rolls in the hot rolling hardness range are highly resistant to shock loading. Tungsten carbide, WC or W2C, is a chemical compound containing tungsten and carbon. Its extreme hardness makes it useful in the manufacture of mill rolls for extended life in applications where long rolling campaigns are required. WC in combination with the binder materials in powder form are mixed, milled, granulated, and compacted to near net shape blanks which are finally sintered in a vacuum furnace. Some rolls are then hot isostatically pressed (HIP). The rolls are then ground using diamond grinding wheels or lathe turned using very hard turning tools to the required dimensions. These rolls are normally used in wire rod finishing blocks and in some shape rolling applications. These rolls require high quality cooling water in a narrow pH range and limited hardness. Using roll cooling water outside the recommended pH range leeches the binder from the roll causing premature roll surface failure. Various grades of carbide rolls are available based on grain size and binder content and binder composition. The range of application in recent years has extended the use of carbide rolls back into the intermediate mills by using a carbide sleeve mounted on a steel shaft. The mounting is carried out by a mechanical method or by creating a composite roll by pressing and sintering a carbide ring on the shaft. The effects of alloying elements on rolls are given in Tab 1. Carbon (C) Increases hardness, brittleness and wear resistance. Decreases ductility, depth of chill Increases hardness, brittleness and wear resistance. Decreases resistance to shock. The types of rolls used in blooming and slabbing mill, billet and merchant bar mill, section mills, plate mill, and hot strip mill are given in Tab 2, Tab 3, Tab 4, tab 5 and tab 6 respectively. The selection of any particular roll depends on production demands, initial cost, specific qualities required, etc. Close collaboration with the roll manufacturer is desirable to ensure that these requirements are satisfied as far as possible. The functions of the roll shop include the following. To receive roll assembly from the rolling mill after completion of a rolling campaign. To wash the roll assembly and dismantle the rolls from the assembly. The rolls are inspected for fire cracks and diameter is measured. Also inspected are the individual parts of the rolls and roll bearing rotated where necessary. The grinding/regrooving of the roll is planned and carried out as per plan. The ground/regrooved roll is stored in roll racks and waits for its assembly as per rolling schedule of the mill. The chocks after dismantling are sent to assembly area for assembling the ground / regrooved roll as per the rolling schedule. The assembly of the roll and chock is carried out in pairs. The assembled roll pair is sent to rolling mill. Chocks and bearing inspections are carried out periodically. The function of roll shop also includes grinding of the shear blades which have become blunt during their use in the rolling mill. The modern roll shop in a rolling mill has the following facilities. Heavy, medium and light duty, fully automatic CNC roll groove cutting machines and roll loaders in case of section and long products mills. Roll shop carries out keeps individual roll performance data and carries out through analysis of the roll data for improving the roll life longevity. For this the shop work in close cooperation with the roll suppliers so as to carry out improvement in the roll chemical and physical specifications is carried out in the next procurement cycle. Roll shop also cooperates with the investigating agency during roll failure analysis in case of a roll failure by providing them the roll history data from their record. The functions of the roll shop also include taking of the timely procurement action for the rolls so that they can make the rolls available to the mill as per the mill requirement. The procurement action is to be taken with an eye to the roll inventory which is to be kept under control. When the life of the roll is over and its scrap diameter is reached, it is shifted to the scrap roll area for their disposal. Similarly broken rolls are also shifted to the scrap roll area after the investigation for the roll breakage is over. There are two software solutions which are used by the modern roll shops. These are roll shop management system (RSMS) and roll defect management system (RDMS) for full control and analysis of roll shop operations. RSMS enables analyses from actual grinding/grooving process monitoring to collection and processing of production, consumption and requirement data, with minimum outlay of resources. RDMS is a powerful tool that enhances and optimizes productivity through deep defect management functions and automatic corrective actions. Further roll shop need to be fully integrated with the rolling mill and there has to be data exchange between the mill system and the roll shop system. The layout of the roll shop is very important for optimizing the logistics of roll movements. Further passages need to be provided for the free movements of forklifts. The automation of roll handling within the roll shop requires the application of safety measures in order to bar personnel from those areas where operations are carried out automatically, and therefore not directly supervised by personnel. There is necessity to provide safety barriers to mark the limits of the automatic working area. In this area access only for maintenance or emergency purposes is allowed.